Toronto—January 21, 2014—As part of Ontario’s diverse and vibrant public school system, Catholic schools have a distinctive faith-based approach to education that is rooted in Gospel teachings. Catholic schools celebrate this distinctiveness in many ways throughout the year including the semi-annual Faith in Our Future Short Video Contest for students (hosted on the social media platform, YouTube). On January 17 and 18 awards were presented to winners of the Fall 2013 Faith in Our Future Short Video Contest. As part of the Association’s Faith in Our Future campaign, the Association invited students to create a 2-minute video that reflects their perspectives on Catholic education and the ways in which the experience has shaped their lives. 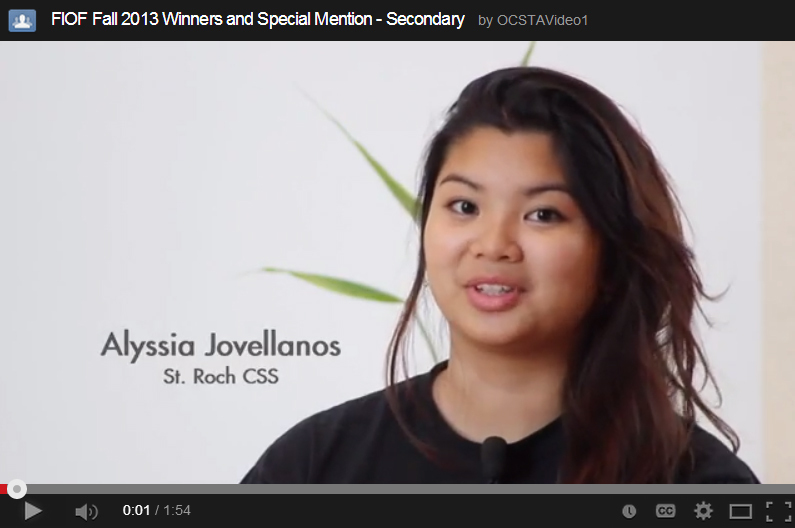 OCSTA selected 6 winning videos that range in style and presentation. First, second and third place awards were selected for both the elementary and secondary levels. Two additional videos were selected for special recognition. To view the YouTube Playlist for Elementary School Winners, click here. To view the YouTube Playlist for Secondary School Winners, click here. All OCSTA’s videos can be viewed at: http://www.youtube.com/ocstavideo1. The Ontario Catholic School Trustees’ Association is the provincial voice for Catholic education. Founded in 1930, OCSTA represents all English Catholic school boards that collectively educate approximately 600,000 students in Ontario, from Junior Kindergarten to Grade 12.